Do you have a water pipe leaking under a slab, concrete, foundation, or paved area? At A1 Sewer water and drain services, we specialize in underground pipe repair for sewers, drain lines, and water mains throughout north NJ. Our service area covers a wide range, including Bergen County, Morris County, Union County, and more. Water main lines, sewer lines, and drain pipes can run beneath paved areas, presenting a challenge for NJ plumbing companies contractors. At A1 Sewer & Drain Services, we can use trenchless pipe repair solutions to fix leaks without disturbing paved areas. 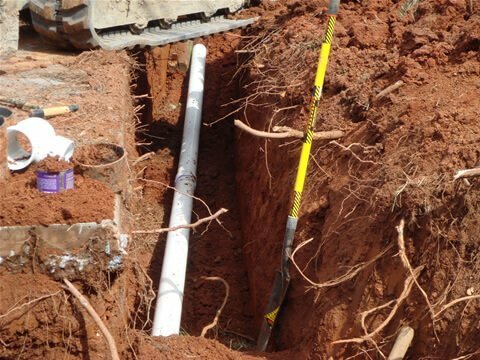 Trenchless NJ water pipe repair and sewer repair services are fast, highly effective alternatives to traditional excavation, which isn’t well suited for pipes beneath paved areas. For great water pipe repair service today from experienced NJ plumbers, call us any time at A1 Sewer & Drain Services, at 201-645-0888. Loose joints. The connections between sections of water pipe can be a prime location for leaks to occur. Loose, cracked, or faulty joints can easily leak water, potentially causing water damage in nearby areas. Corrosion. 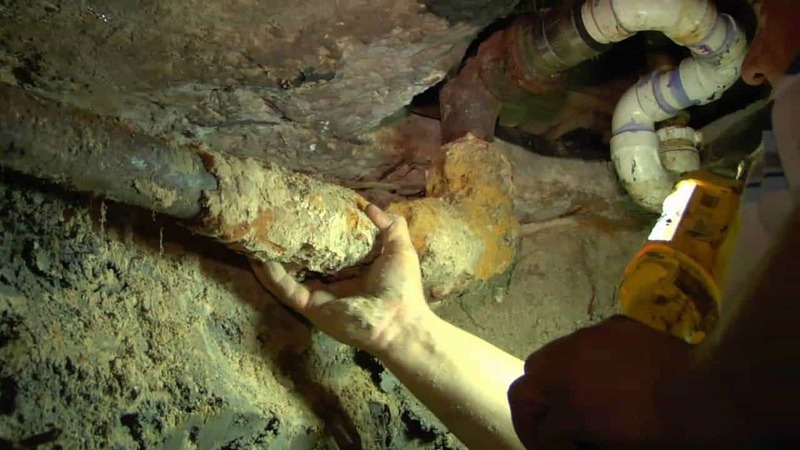 Copper and cast iron water pipes can last for decades, but eventually, they’ll succumb to ongoing corrosion. 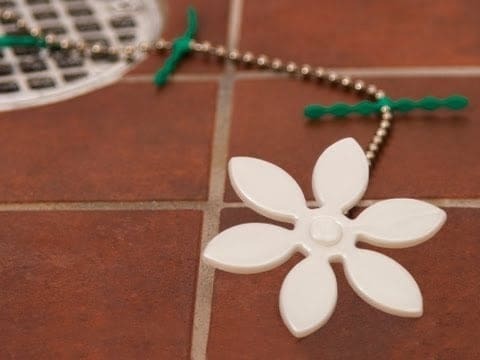 Water chemistry, microbial activity in sewer pipes, and other processes can wear away at the metal, creating holes and cracks that leak out water. Water pH is especially impactful on the rate of corrosion in a metal water pipe. Water with a pH less than 8 dissolves protective copper oxide layers in copper pipes, speeding up the corrosion process. High dissolved oxygen content can also facilitate corrosion, as can elevated water temperatures. 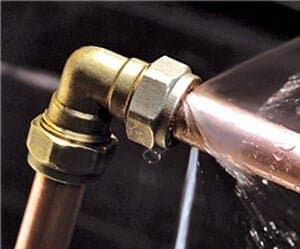 Water pipe leaks from corrosion can be fixed by a plumbing contractor with pipe lining or water pipe replacement. Tree root incursion in sewer pipes. Tree roots are attracted to moisture and nutrients inside of sewer pipes, and can enter through pre-existing cracks and holes. Tree root incursion is a leading cause of collapsed and broken sewer pipes, and extensive sewer repairs or sewer replacement are often needed. Trenchless pipe repairs are ideal for water pipes leaking under a slab, street, foundation, or paved area. Open cut excavation for underground water pipe repair will damaged any paved areas above the pipe, increasing the repair costs and creating a major inconvenience for homeowners, businesses, and communities. The most common form of trenchless pipe repair for underground water pipe leaks is pipe lining. Pipe lining can be carried out using small access points, or through the cleanout in the case of sewer relining. Using a pneumatic bladder, a resin-coated liner made from fiberglass cloth is moved into position with the aid of fiberoptic sewer camera systems. Then, the bladder is inflated to press the pipe liner against the walls of the pipe. After the liner has been cured and hardened with UV or heat, the bladder is deflated and removed, leaving a corrosion-resistant and waterproof liner that stops water pipe leaks and patches holes. The liner can last up to 50 years after installation. 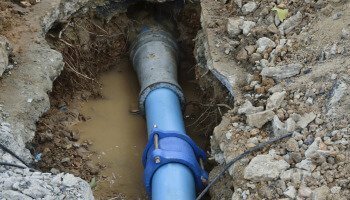 If a pipe has been severely damaged, or has collapsed completely, you may actually need water pipe replacement. Replacing pipes beneath a slab or paved area is tricky, since open cut excavation leads to costly damage to the area. Digging underneath a slab can also compromise its stability and integrity, leading to serious safety concerns. Trenchless pipe bursting provides an alternative to open cut excavation, and can be useful for replacing water lines, sewer pipes, and drain pipes that run underneath streets or slabs. 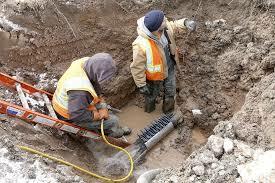 This process can be carried out through small access points, without excavating to expose the entire pipe. At A1 Sewer & Drain Services, we provide residential, commercial, and municipal sewer repair, water pipe repair, and drain pipe repair in NJ. For service today, call us now at 201-645-0888.